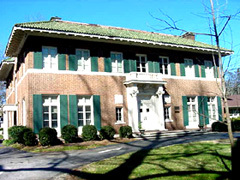 The residences built in the Druid Hills Historic District during the early 20th century are among the finest examples of period architecture in the Atlanta metropolitan area and the State of Georgia. These period houses range from mansions to bungalows. The district includes a wide variety of eclectic and revivalist architectural styles, with the Georgian, Tudor, Jacobean, and Italian Renaissance represented in the greatest numbers. Druid Hills is also one of the major works by the eminent landscape architect Frederick Law Olmsted and his successors, the Olmsted Brothers, and their only such large-scale work in Atlanta. Druid Hills is important as the home of many of Atlanta's citizens who were prominent in early 20th century political, financial, commercial, professional, cultural and academic affairs. As the second major suburb of Atlanta, Druid Hills had a profound effect on the direction of future suburban development. During the late 1880s, Joel Hurt conceived of an "ideal residential suburb" to be developed at the future site of the Druid Hills Historic District. Hurt, a prominent Atlanta businessman and developer, helped create Inman Park, Atlanta's first suburb, in the 1880s. Between 1889 and 1892, Hurt organized the Kirkland Land Company, and in 1892 Hurt secured Frederick Law Olmsted, Sr.(1822-1903) , as a planner and designer for the new suburb. Olmsted, nationally known for his work at South Park in Chicago, Prospect Park in Brooklyn, and the grounds of the Capitol in Washington, D.C., was to prepare preliminary overall plans and designs. By 1893, Olmsted's preliminary plan called for a broad, curving, divided major avenue (Ponce de Leon Ave.), with a succession of public parks in the median, bordered by large estates. Financial difficulties slowed work on implementing Olmsted's plan. In 1905, the Olmsted Brothers submitted a final plan, and construction began. In 1908, the Kirkland Land Company and its holdings in Druid Hills were sold to the Druid Hills Company, whose president was Coca-Cola magnate Asa Candler. The final work was completed in 1936. Aside from Candler and his family, other prominent residents of Druid Hills included John Ray Patillo, president of the Patillo Lumber Company, and William D. Thompson, dean of the Emory University Law school. Some of the most distinguished early 20th-century architects practicing in Atlanta designed houses in Druid Hills, including Walter T. Downing, Arthur Neal Robinson, Henry Hornbostel and Neil Reid. The Druid Hills Historic District also incorporates in its entirety the previously listed Druid Hills Parks and Parkways Historic District. Druid Hills is roughly bounded by the Fulton County line on the west, Briarcliff Rd. to the northwest, just over the Emory Rd. line on the north and following the southside of Emory Rd. The boundary cuts south and juts east around the Fernbank Forest and Recreational Center, then cuts east and south along tracks of the Seaboard Coast Line. South it is bordered by North Ave. and the Atlanta City Boundary. The houses in the district are private residences and are not open to the public, but there is more information available through the Druid Hills Civic Association. Walking tours are available at 10:00 am on Saturdays only from March to November. Twilight tours are also available. Visit the Atlanta Preservation Center for more information.